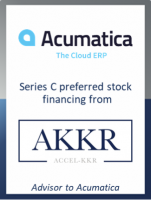 GCA has advised Acumatica, the world’s fastest-growing cloud ERP company, on a USD 25m Series C Preferred Stock financing. The round was led by institutional investor Accel-KKR, a prominent Silicon Valley technology-focused investment firm, and existing investors. Acumatica will use this investment to further accelerate its rapid growth in the USD 28bn Cloud ERP market and help extend its lead in AI, machine learning and Cloud/SaaS technologies for business management and financial applications. This transaction is GCA Altium's 14th in the Technology sector to date in 2018 and underpins its strong expertise in the software space. Headquartered in Bellevue, WA, USA, Acumatica has been a disruptive force in the ERP (Enterprise Resource Planning) space, built on cloud and mobile technology and a unique customer-centric licensing model. Acumatica delivers a complete real-time view of clients’ businesses through a suite of fully integrated business management applications including Financials, Project Accounting, Commerce, Manufacturing, Field Service, Construction and CRM, that are accessible anytime, anywhere, on any device. The Company’s suite of products delivers the real benefits that today’s businesses require in their ERP system, helping them control inventory, increase productivity, connect anywhere, adapt to change, improve cash flow, and respond to requests quickly. GCA acted as exclusive financial advisor to Acumatica in connection with this transaction.